John Fidler Cody-Simpson was born on 9th August 1944 in Cleveleys, Lancashire. Only two weeks previously, his mother had been ushered onto a train at King’s Cross station in London by her concerned husband. They had just – miraculously – survived yet another night of air raids; their Croydon flat had been struck, and their unfailing optimism had finally tumbled in the noise and fear of the night. At the station, Roy Simpson had fished out a handful of silver coins – possibly all he had in the world – and pushed them under the glass screen towards the ticket clerk. It came to one pound, eighteen shillings and ninepence. It didn’t cross his mind to buy two tickets: he couldn’t afford them, and the most important thing was to get his pregnant wife away. In first class, the clerk told him, that would take her to Stratford-on-Avon; in second class, she would get to Stoke-on-Trent. The clerk frowns and consults his chart again. Behind my father there is a little sigh of pleasure. Blackpool seems to represent everything the war has taken away. My mother turns and smiles, and the joker, abashed, is entirely won over by her. 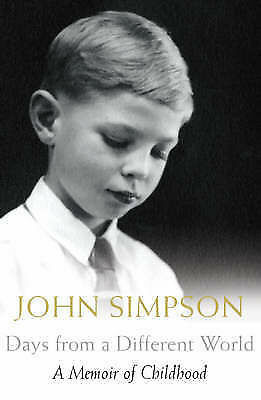 It comes as an extraordinary revelation to read John Simpson’s first volume of autobiography, ‘Days from a Different World’. You feel as if this well-loved and well-respected reporter, whose face has appeared to so many of us on our TV screens from war-torn regions of the world, speaking with unshakeable composure as shells explode around him, has actually seen and felt the experiences of his parents in the Blitz and is recalling them with absolute clarity. But so much else is there, too. His father had the kind of blissful nature that sees adventures instead of problems; a natural showman, he loved telling stories, and thrived on excitement. His mother, on the other hand, was quiet, patient, observant; strong, in her own way, a natural survivor. Their romance succumbed to reality when John was only six; he remembers desperately trying to keep them together, acutely aware of some intangible conflict which he tried – and failed – to heal. John seems to have acquired something from both of them: his overriding curiosity has always found the heart of the drama, leading him straight to the door of dictators and despots – not without fear, but with an insatiable thirst for the truth; and he has an extraordinary capacity for observation, alert to every nuance, watching, remembering and recalling with the kind of balanced integrity that millions of people have come to know and trust. 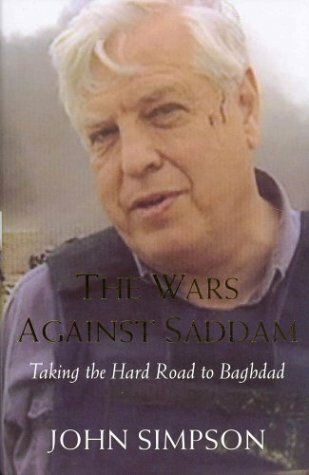 On 5th April 2003, the bleeding face of John Simpson was broadcast on BBC News 24 from Northern Iraq, burning vehicles behind him, the evidence of bodies and injured people in shocking reality for millions. Simpson, wearing a flak jacket over a blue shirt, was maintaining a professional composure despite having been only a few yards away from a 1000-lb bomb that had fallen just minutes before. By a miracle he had survived, although his translator, Kamaran Abdurazaq Muhamed, and several others had lost their lives. This was by no means the first of John’s close encounters with death; nor would it be his last. Having begun in the BBC as a sub-editor in 1966, he rose to become Political Editor, Diplomatic Editor, and then World Affairs Editor in 1988. His work put him quite literally in the line of fire: wherever there was trouble, he would be heading there on the next and possibly only available plane, when hundreds of thousands of people, including many other journalists, were getting themselves out. And just being at the heart of the conflict wasn’t enough: to do his job, of course, he had to have ground transport, a film crew, a reliable translator, and the equipment with which to make his broadcast. A safe place in which to do it was sometimes an elusive luxury that he had to make do without. It was in 1989 that he found himself in war-torn Afghanistan, recording a piece to camera with mortars exploding in the background. The group of mujaheddin who were firing the mortars had allowed John to film them, but the crew gradually became aware of a new figure in their midst – a young man in white robes with an impressive beard and the eyes of a fanatic. Having failed to persuade the Afghans to undertake the task, the white-robed man turned his attention to the driver of an ammunition truck and offered him 500 dollars to run them over. The driver laughed, and refused. Acutely aware of the price on his head – which caused him mild annoyance for being so low a figure – John and his team followed the man back to his hide-out, where they found him sobbing and beating his pillows in frustrated rage. Nine years later, when the man’s image was flashed around the world as the head of Al Quaeda, a new major threat to world peace after the bombings of US embassies in Kenya and Tanzania, John recognised him instantly: it was Osama Bin Laden. 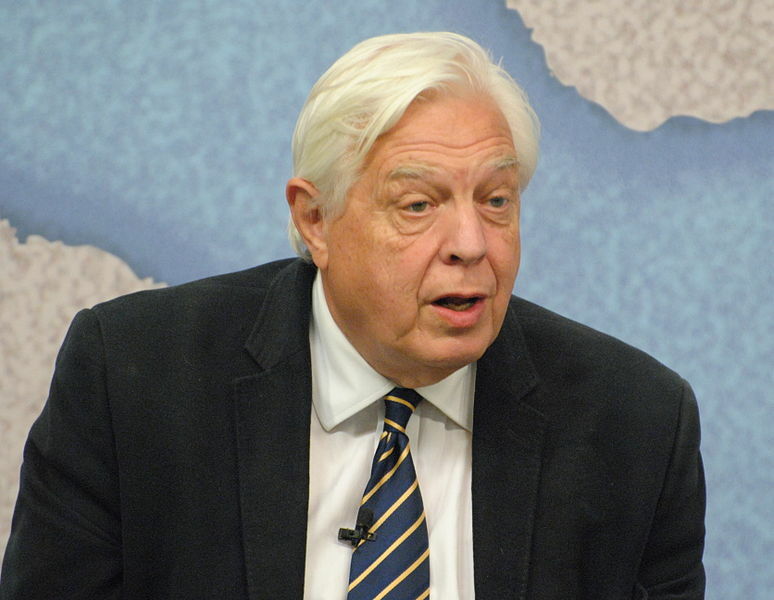 Osama Bin Laden’s death threat was just one of many that John Simpson has received in his long and colourful career. But power-crazy dictators always seem to want to talk to him, just as much as he wants to talk to them. There is certainly an element of fear, but John’s underlying curiosity about people always wins out; he has a nose for conflict and an air of intelligent authority that encourages people to confide in him. You almost get the sense that they want him to like them, despite the uncomfortable questions that he’s famous for asking. During his first assignment as a BBC journalist in 1970, he was punched in the stomach by Harold Wilson for asking if he was going to call an election. But that is John’s style: he gets straight to the point, and he gets reactions. His commitment is absolute. ‘Days from a Different World’; ‘The Wars Against Saddam: Taking the Hard Road to Baghdad’; ‘A Mad World, My Masters’. Oh goodness! Small world, David. 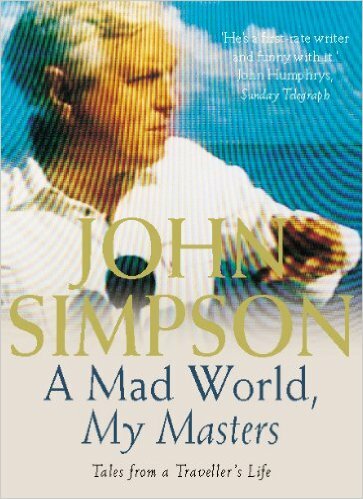 🙂 I think you might also enjoy John Simpson’s books – very well written, as you would imagine. A fascinating review, Jo. He’s become a British institution really, hasn’t he? Whenever I see him reporting I feel myself sitting up and taking notice. You feel you can trust him completely to understand the situation he’s describing and to report it accurately. The BBC are lucky to have him, and it’s great that they’ve given him an open-ended contract; I bet they haven’t issued many of those in their long history. I hadn’t heard of the series with Ranulph Fiennes and Robin Knox-Johnston but it sounds like an intriguing idea for a documentary. I can easily imagine him enjoying the camping trip, he must have inherited that boyish enthusiasm for adventures from his father. Thank you, Lorna, and I agree completely about John Simpson being a British institution. The BBC are certainly lucky to have him – and he has risked his life on so many occasions in order to send back the fullest and latest reports. It amazes me how lucid and composed he is in situations that would be traumatising to most of us, to say the least. I would love to have seen that series with Ranulph Fiennes and Robin Knox-Johnston but it is now unavailable. I must make further enquiries!